-The protection of soil, water and natural resources on your farm and reducing any impacts on water quality and neighboring properties. -Learning how conservation can lead to increases in farm productivity. -Assuring that your farm complies with Oregon Department of Agriculture and Department of Environmental Quality regulations. -Demonstrating that voluntary commitment is an alternative path to best management practices without additional regulation. -Streamlined access to financial resources (grants), if available, and project assistance through Lincoln SWCD. 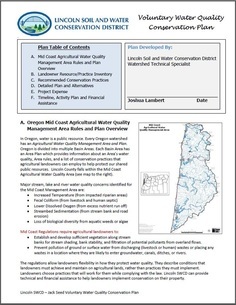 Plans and technical assistance are a free service provided by Lincoln SWCD's Restoration Program Staff and our partnering NRCS Conservationist. Call or email and schedule a site visit today.